Do you charge for an annual Waste Transfer Note/Duty of Care? No. All Waste Transfer Notes and other documentation are provided free of charge as part of your service. There are no additional hidden charges. Can I have a collection of recycling in bags and from a wheeled bin? Yes. We offer options of wheeled bin and bagged collection services, or a combination of both. We will create a service that works best for your business. Do you offer a general waste collection service? Unfortunately we don’t. We only offer recycling services at this time. However, by recycling with us this should significantly reduce the amount of waste you have to dispose of, helping to minimise expensive general waste disposal costs. Does the recycling have to go in bags or can it go straight into the wheelie bin? Your recycling can go straight into the wheelie bins. The most important thing is that the materials are kept separate e.g. cans go in the cans bin, glass goes in the glass bin etc. Can the food waste go in a plastic bag and then into the wheelie bin? No. Food waste should be put straight into the wheelie bin. Alternatively, we do offer small compostable bags for use in the kitchen, or we can line your wheelie bin with a large compostable liner. Please contact us about these optional additional services. Do we have to tape the cardboard as part the bagged service? No, cardboard can be kept loose for collection. We do however ask that you flat-pack the cardboard as much as possible and if you do have tape or string available to secure it, that would be very helpful for our collection staff. Can we mix coloured and white paper together? Yes. We can collect office paper, magazines, leaflets, envelopes and shredded paper. This can all be put in the bags or bin provided. Do you collect confidential waste? We do not currently offer a registered confidential waste collection service. However, please contact us with your needs and we may be able to help. 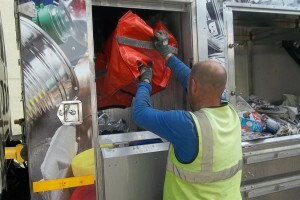 Do you provide storage facilities for the bagged waste collection? We offer cardboard recycling bins that the bags provided can fit into. These are ideal for offices or communal areas and make it easy for all staff to make use of the recycling services. Can I mix plastics and cans together in the clear bags? No, the materials must be kept separate. This ensures a high recycling rate and enables us to keep collection charges to a minimum. Do you offer one off collections for example if my business was moving location? Yes. If you require a one off collection when your business is moving, or if you are having a clear out, contact us with your requirements and we can schedule a collection. If you already have a regular collection with us, we can also offer additional collections if needed. Yes, charities with a registered charity number are eligible for a 50% discount on our bagged collection service.